Center Parcs Woburn Forest is one of five Center Parcs villages in the United Kingdom. As well as being a popular destination for short breaks, it is also an award winning provider of conference spaces for the corporate market. Woburn Forest is the first Center Parcs location to have a purpose built conference building. The building, named The Venue, comprises of eight individual and flexible event suites and a business centre. The space can cater for up to 800 people and is used for a range of business events, conferences, meetings, product launches and team building activities. Only an hour away from London, the location means Center Parcs Woburn Forest is competing with many other conference locations in the capital. So the building needs to be of the highest standard, with impressive facilities, to attract businesses to their space. The Venue has been designed to be flexible, to fit with client requirements, whilst being a relaxing and inspiring environment surrounded by forest. 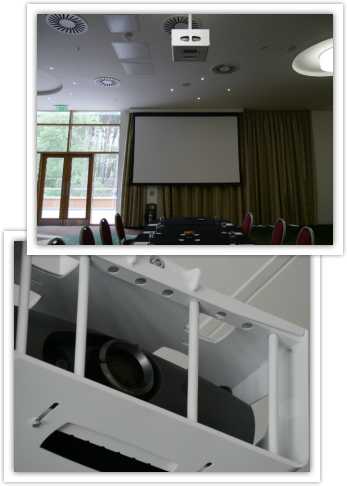 To complete their conferencing space, Center Parcs needed high quality projectors that were available for use in all rooms, for all occasions. Center Parcs chose Panasonic projectors which compliment the professional corporate image they were keen to portray. MVS Audio Visual were chosen as the AV intergrators to design and install the AV requirements at The Venue. As MVS already work with Center Parcs holiday villages at Longleat Forest, Elveden Forest and Sherwood Forest they had expereince in meeting the requirements of the company. MVS chose Panasonic and the PT-RZ470 and PT-RZ670 1-chip DLPTM LED/laser projectors as they are reliable, with long lasting brightness and an instant start up/switch off. This means the projectors are immediately available for use for clients during their time in The Venue. Prior to the installation of two PT-RZ470’s and four PT-RZ670’s, Center Parcs had been using portable projectors and setting them up as and when they were needed. Another complicated option was for companies to hire AV support separately. The installation of the Panasonic projectors means that this hassle has now been eliminated and events can run smoothly and cost effectively. "Center Parcs are extremely impressed with the end result and are now able to offer professional AV services in their corporate spaces without the need to bring in event/hire companies every time they have an event," said Alistair Maher, National Project and Service Manager at MVS Audio Visual. Liz Pilling, Conference and Events Manager at Center Parcs Woburn Forest explained how the flexibility of the projectors has also been a valuable asset at The Venue, "The projectors turn on instantly, so our guests can start working straight away, they're also quiet in operation, so that they don't disturb meetings. Also the projector screens can be subtly hidden away in the ceiling, if they are not required for a particular event." The PT-RZ470 projector features 3D projection, long lasting brightness, 24/7 operation and multi-screen portrait projection with edge blending. Easy installation allows landscape and portrait mounting as well as vertical/horizontal/tilting 360 degrees projection without any effect on the life of the light source, which is not possible with a traditional lamp source projector. ‘’The Panasonic projectors deliver a very high impact, with crystal clear images and bright images I have never seen in lamp-less projectors previously.’’ continued Alistair Maher. As the projector is powered by a laser light source, there is no requirement for replacement lamps or filters, and the laser light source has a working life of around 20,000 hours or more, depending on usage. The PT-RZ670 is an addition to Panasonic's existing Solid Shine™ line of projectors, and also features 20,000 hours no maintenance. 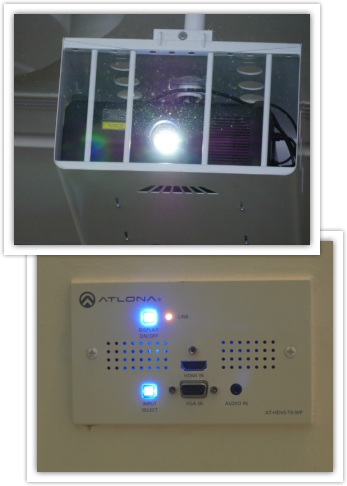 The projector has a long lasting reliability, high picture quality and a quick start/quick finish functionality. "We’ve had great feedback from clients on the new projectors; we’re so pleased with the equipment." added Liz Pilling.